Come down to our ice cream shop! Your patronage supports jobs for the people with disabilities who work here! Hmmm. The idea of social enterprise is a wonderful concept. Having a business that incorporates diversity and funnels its profits into social causes, including supporting people with disabilities, has much potential. But here’s the problem. Agencies that are charged with getting people community employment are using the concept as a systems model to be replicated as a significant part of their solution to unemployment. This has turned into a bit of a sideshow. Three years ago, I wrote a blog post that took a critical look at the growing trend in social enterprises as a solution by agencies for the unemployment of people with disabilities. 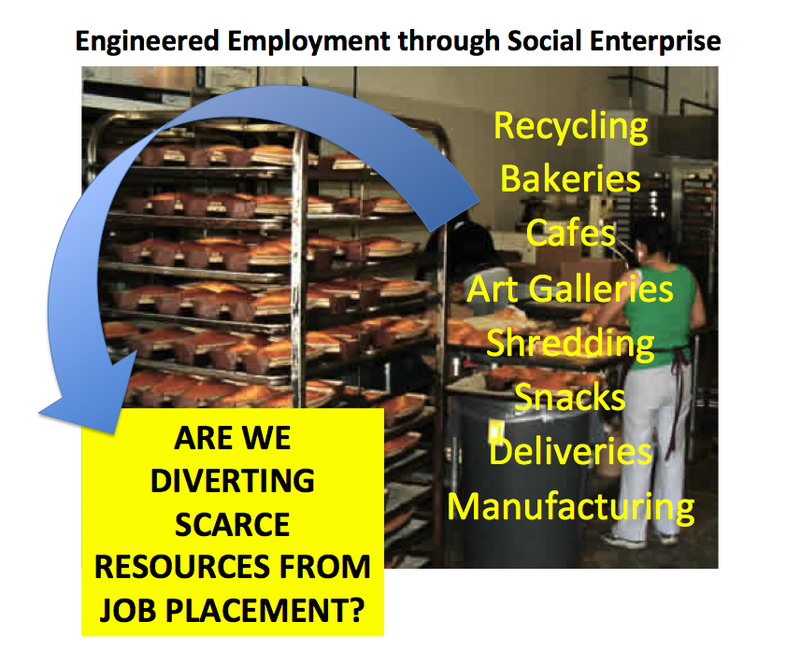 I noted a number of major concerns with such approaches, and I used the term “engineered employment” to describe them. After recently visiting a number of agencies that were in the process of converting their facility-based services to “community employment,” I have found nearly all of them have been struggling to enhance their job services. But what they are also spending a great deal of time, money, and resources doing is developing their agency-owned businesses – selling muffins, snacks, shredding, recycling, art studios, cafes, farms, ice cream shops, and so on. And then they tout these as community employment success stories. From my observations, it’s easy to see why agencies will prefer this path rather than direct job placement. For example, “social enterprise” is an impressive cutting-edge term. It can be traced to European worker cooperatives in the early 90s that provided work for people with disabilities. It has a certain allure. Secondly, setting up a business can be an enjoyable and satisfying challenge, especially when you have a grant that will fund it. Third, it’s a nice thing to show off to families and visitors – there is a central location and it is easy to understand. Fourth, often the workers there are thrilled to be out of a workshop. And it can demonstrate the capacity of a worker with a disability in a community work setting. But analyze this closer. What are the real outcomes and costs? And given the deplorable state of segregation and high unemployment of people with disabilities, is this where our focus should be? It is a formidable challenge to develop a quality job placement program. You need to do good hiring, quality training, develop career assessment practices, employer engagement strategies, and have effective job support strategies. From experience, I can tell you that this takes a lot of resources, work and a laser focus. But the payoff is huge. You can find well-matched jobs for high numbers of people with whatever job challenges they possess, once you have a flexible and competent system in place. But if you are running a business, or worse, several businesses, where are your energies? They are diluted with maintaining and subsidizing one or several business models that are providing work that may or may not be of interest for a very small number of individuals. This is not to say that all micro-enterprises are to be avoided. Self-owned businesses are a reasonable job solution for the generally small numbers of individuals who have a passion for a particular business. But this must evolve from the individual, and not the agency thrusting it on the individual. Non-profit human services, by necessity, must be lean and highly targeted to their mission. Service designs must add significant value and offer individualization to the people you serve, and not just add value to the reputation of the agency. Unfortunately, social enterprises rarely add enough direct value for the effort an employment services agency must put in. They also often require ongoing subsidies, using resources that should be going to job placement. And they offer “fixed job types” that are not grown from personal choice. Finally, the expertise of most human services management is not geared to business profitability, which social enterprises still require. Ask yourself if your enterprise can be quickly spun off and survive on its own? Ask if there are workers with a real passion for that work – not just those who were placed there and have come to be comfortable? Ask what the costs will be per the number of individuals served? Ask if this business is competing with other employers in the community – the very people you are seeking to act as a resource to? And if there are still good reasons to develop or maintain a social enterprise, are you willing to let the workers own the business, rather than the agency? If one of your goals is to provide community employment, do not dilute your mission with an enterprise that will “engineer jobs” that haven’t grown out of personalized career assessment or discovery. Funders and policymakers need to stop funding these efforts with seed money that should go to job developers and employment consultants. Disability services have access to a relatively fixed pool of resources, folks. And 4 out of 5 people of working age with significant disabilities aren’t in community jobs. When you pull money away from your main mission, you better have some innovation in mind that will eventually produce job outcomes at least as good as customized job placement. Right now, and I have looked closely at several, I cannot find any in social enterprise.